← Three Very Ugly Bizniz Lessons Revealed! Was it the absolute geekout of Marvel Pictures’ onstage presentation of the Avengers cast? Was it Harrison Ford’s first-ever appearance at the con? Was it the screening of shocking footage from Dexter’s upcoming fifth season? For me, the high spot happened at a tiny booth lost among some 5,000 others in the main exhibit hall. Alex from A Clockwork Orange, fer kryssakes! I’m talkin’ about the guy who portrayed Harry Flashman in Royal Flash, H.G. Wells in Time After Time, and Caligula in one of the worst movies ever. You know, the dood who played the contemptible Linderman on Heroes. McDowell is one of the very few cult icons I always hoped I’d meet someday. So last Saturday for, oh, about 27 seconds, I finally stood before the great actor. And I was so starstruck, I stammered, hemmed, hawed, and blathered inanities. I’d felt like an idiot, but he made it OK. It made me think of all the times I could’ve offered someone a compliment – but didn’t. When did you last make a friend or family member — or a customer — feel better with a flattering remark? It’s not so hard to do. And it sure pays off in building personal, and professional, relationships. 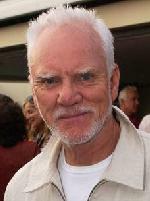 Anyway, if I ever see Malcolm McDowell again, I swear I won’t choke on my yarbles. I’ll say something real zammechat. P.S. Don’t forget. There are LOTS of tips about building great business relationships in my book Fire-Up Your Cash Flow Over a Donut and Coffee, which is available as a free download.